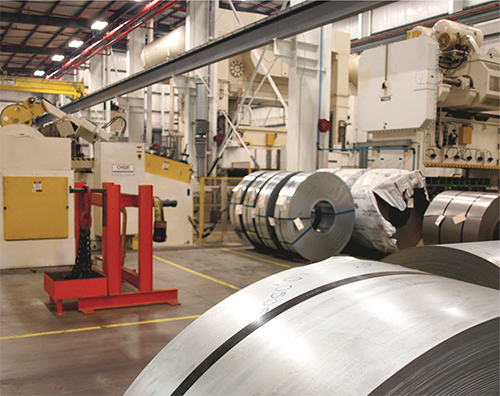 An aggressive approach to expansion into the low- to mid-volume automotive supply chain has led metalformer Quality Metalcraft Corp., Livonia MI, to rapid and significant growth. Previously focused on prototype work and specialty production, now QMC has expanded to support mid-volume production stamping and assembly work. A 30,000-sq.-ft. addition made to the QMC production facility stars two new Eagle press lines—a 600-ton progressive line (foreground) and a 2500-ton transfer. Both consume coil stock delivered by CHS Automation servo-feed lines equipped to process an extremely wide range of material thicknesses. That evolution has hinged in large part on investments made early in 2015 when QMC commissioned two new press lines, a 600-ton progressive line and a 2500-ton transfer press. In just a few months, QMC had increased its booked capacity by 400 percent, and opened doors for additional business. The new work has required the company to nearly double its employee head count at its 212,000-sq.-ft. production facility; QMC operates out of four facilities in Livonia, including one that houses 38 manually operated presses dedicated primarily to prototype design and development, and some very low-volume production. QMC has loaded its transfer press differently than most stampers would, Long says. It has 35 different jobs slated for the press, whereas most shops might fill up a transfer line with 10 or 12 different jobs. In addition to those new transfer dies (each typically with five or six stations), the facility has 90 part numbers slated for its new progressive line. Among special coil-line features specified by QMC and engineered by CHS: a leading-edge bending station for back-bending material prior to thread-up; material pass deflectors under the edge guides, to simplify threading; and 5-ton screw jacks (10 tons/roll) to help the straightening of heavy-gauge sheet and higher-strength steels. The 8-ft.-deep looping pit, originally believed to be unnecessary during project planning, has proven to be a blessing, in part to provide continuous feeding and eliminate marking on Class A parts. QMC’s two new workhorse press lines work in a new 30,000-sq-ft. addition to the plant constructed in 2014. Both presses are Eagle models—a 240 by 96-in. press with Wayne Trail front-to-back servo transfer system, and a 144 by 60-in. progressive-die press. The firm stamps an inordinate variety of part sizes, material types and thicknesses, from 0.030-in.-thick flat sheetmetal parts to 4-mm frame components, as well as Class A sheetmetal. Material mix is two-thirds steel, including some dual-phase advanced high-strength steel, and one-third aluminum. 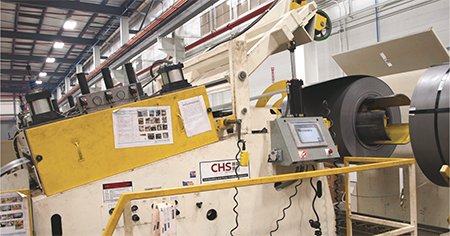 Both press lines consume coil stock delivered by CHS Automation feed lines—48-in.-wide by 20,000-lb. coil capacity on the 600-ton press, 72-in.-wide by 30,000-lb. coil capacity on the 2500-ton press, “with plans to upgrade to 50,000-lb. capacity,” adds Long. Both lines are specifically designed and built by CHS to handle a range of material thickness, from 0.020 to 0.375 in., including wide backup rolls to support feeding of dual-phase steel; chromed rolls to ease cleaning and facilitate quick changeover from aluminum to steel; a dual-caliper braking system to help control the material and avoid clockspringing; and the ability to quickly adjust roll pressure using 5-ton screw jacks (beefed up from the typical 3-ton setup). Automation spreads well beyond the pressroom and into the plant’s 12 production cells housing a total of 84 robots. Shown here (above) is the newest robot cell, used to press-brake form 400 different part numbers and a total of 15,000 units annually. Parts, for the heavy-truck industry, vary just slightly based on bend angle (1-deg. increments from 81 to 99 deg.) and hole pattern. To manage the production complexity, the cell includes a camera system that reads a binary hole pattern laser-cut into each blank. 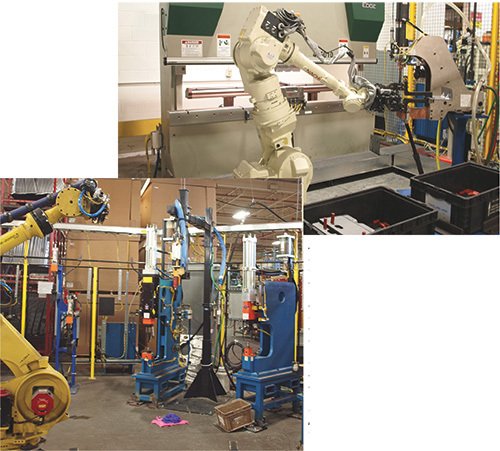 The production cell at the left features a robot that carries a fixtured assembly of six parts around the cell, where a variety of operations occur including welding, sealing, flanging and riveting. The feed systems also include seven-roll straighteners (3.5-in. roll dia. on the prog-press line, and 4.2-in. roll dia. on the transfer line); laser-based sensing to track coil OD in real time and automatically adjust roll/ brake pressure as the coil depletes; automatic coil centering; and (on the transfer press) an 8-ft.-deep looping pit to ensure smooth, consistent material feed, “especially critical when stamping Class A parts,” says Long. Lastly, as yet another example of flexibility at its finest, the feed setup for the progressive-stamping line features a specially engineered end wheel to hold down strip as narrow as 1 in. With its relatively high-mix low-volume (1500 to 80,000) production plan, quick changeover obviously becomes critical. Long estimates that the pressroom spends 12 hr./week in die changes, and has plans in place to reduce that by half and open up additional capacity. Plans include adding a second rolling bolster to the transfer press, which is equipped with quick-pull quick-change transfer tooling; on the progressive line, an Atlas die-change system moves dies in and out in 7 min. The robot count at QMC is high—84 robots spread over 12 production cells, performing a wide range of operations including resistance welding, scribing, sealing, press-brake forming and riveting. We spied, for example, one cell fully automated with one robot manufacturing nine variations of an automotive assembly. That workhorse robot carries a complete fixture assembly, comprising as many as six different parts, around the cell to its various workstations. Operations performed include resistance welding, sealing, flanging and riveting.